Hair loss is one of life’s incredibly troublesome problems. Generally it tends to come with aging as a natural process. But for many, it can be an accelerated process which can effect adults as young as 20. Hair loss can feel like not just a loss of strands of hair but the loss of your control over your own body. For many it may seem like there is no option to reverse the process or even just to halt it. At least not besides incredibly expensive surgery. However, there are new and exciting advancements in hair growth and the reversal of this awful process. Utilising laser technology HairMax intend to be at the forefront of this movement. With a wide range of products suited to restoring your hair’s natural growth cycle and regrowing denser hair, they offer hope where previously there was none. Whilst all of the products within this article have been clinically tested to work. They are not suitable for all cases of hair loss. What is a Laser Comb? Laser combs use low level lasers to stimulate hair follicles. Appearing as stylish or futuristic hair brushes, they allow you to comb through your hair while applying advanced treatment to restore your hairs natural growth cycle. The process requires you repeat it several times over a given period of a few weeks for just minutes at a time. Different models require different amounts of treatment and the higher range products generally promise greater results. However they all insist on continued treatment (within the specified timeframes) in order to achieve the desired results. In regards to higher end models, their defining features are more lasers which improve effectiveness. 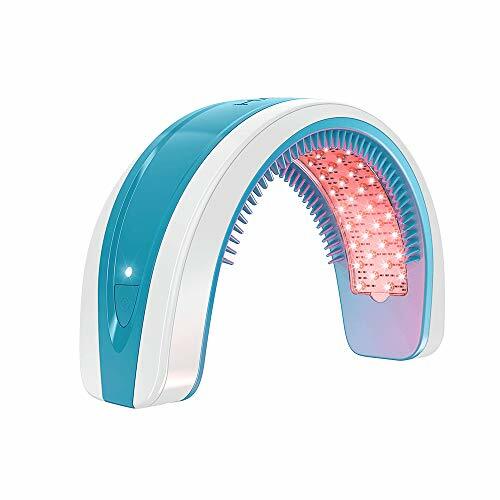 A HairMax laser comb utilises patented hair parting teeth to ensure that the optimal amount of light energy reaches the hair follicles on your head. Due to hair being a photoprotectant, without the parting teeth to clear a path for the lasers, the effectiveness of the treatment would be significantly lessened. With the HairMax patented hair parting teeth, their laser combs have a distinct advantage over competition. The laser combs themselves are sleek and stylish wireless devices. Each of the three laser combs that we will cover within this article are lightweight and slim. The attractive and intuitive design is a pleasure to use. Powered by rechargeable batteries, the laser combs are entirely portable and prevent any tangling of wires as you apply the treatment to your scalp. This, I noticed, took away one potentially irritating part of this process and left me with a relaxing experience. 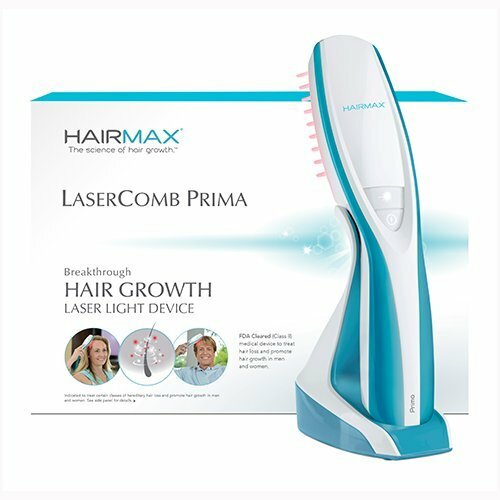 Does the HairMax Laser Comb really work? When it comes to products such as these, it is hard to believe in them without seeing the proof first hand. From worries of harmful side effects and the desire to avoid a scam, many people will naturally avoid investing money without some compelling evidence. 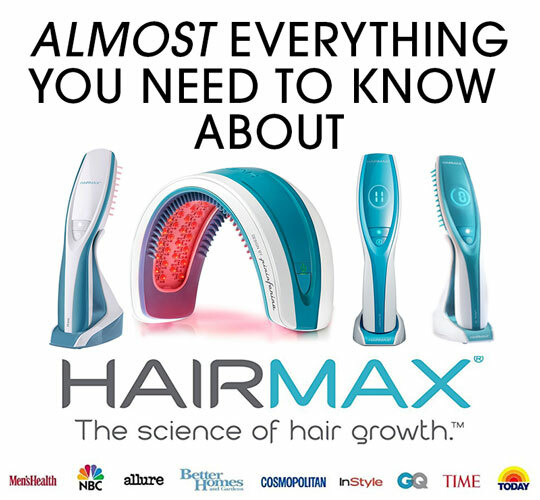 Luckily for anyone suffering from hair loss, HairMax laser combs have been FDA cleared and clinically tested. Whilst they are not proven to work in every single situation (as no products ever are), the HairMax laser combs have been thoroughly tested by trusted sources. The Universities of Minnesota and Miami among others conducted studies that tested the HairMax laser comb on more than 450 male and female subjects between the ages of 25 and 60. All subjects had suffered from Androgenetic Alopecia for at least one year prior to the study. Each person used the HairMax laser comb for 8-15 minutes three times a week for a total of 26 weeks. Across the study a 93% success rate was achieved. Subjects benefited from reduced hair loss, a restoration of the hair growth cycle and fuller, thicker hair. Across all of the studies conducted, no side effects were reported whatsoever. Low Level Laser technology has been used and studied for over 40 years and has consistently been proven to be safe. Using the product over the recommended time will not prove harmful, though it may cause the process to slow down. But regular use within the specified guidelines will not prove harmful. Across online retailers such as Amazon, there have been no reported instances of the laser combs having any harmful effects. Generally, through clinical studies, it is suggested that it takes 12-16 weeks in order to see visible results from using a laser comb. This requires consistent usage as stated above and by pausing or stopping the treatment early, results can be halted and lessened. After the duration of the initial 12-16 weeks, you must conduct regular treatment to maintain results, though possibly at a lesser rate than previously. What about the negative reviews I have read online? As stated previously, laser combs will not work in 100% of cases and instead depend on the individuals own circumstances and their conditions. Many major retailers of HairMax products offer extended money back guarantees allowing you to safely trial the product to determine whether or not it is suitable for yourself. With no possible side effects of the product, those who use the laser comb will be sure that it either succeeds and restores their hair growth as desired, or they receive their money back. When purchasing the HairMax products, ensure that your chosen retailer offers a suitable guarantee. HairMax’s own website for instance, offers a money back guarantee but includes a re-stocking fee. QVC in the United Kingdom offer a 120 day money back guarantee which sets a decent benchmark for your purchase. Who should use HairMax products? The products have been proven to work on both men and women suffering from hair loss. Whether the person in question suffers from hormonal imbalances or Androgenetic Alopecia, the HairMax laser combs have proven effective in many cases. Again, as I said before, the laser combs will not work in every case and should be treated with an appropriate level of scepticism. However, their success rates and money back guarantees make it a product worth trying if you find that hair loss is causing you any personal issues. As there are multiple HairMax laser combs, I will address the different models separately. But on average the HairMax products should be used from around 8 to 11 minutes three times a week consistently over at least several months. With continued usage for prolonged results. Doctor Recommended. FDA Cleared for Men & Women. 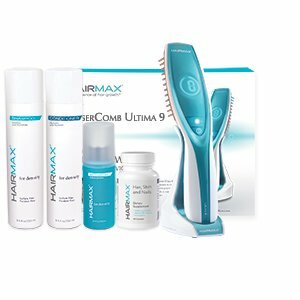 At around $295 the HairMax Ultima 9 Laser Comb is one of the more expensive products on this list. Using 9 medical grade lasers and HairMax’s patented hair parting technology, it applies the treatment directly to your hair follicles for highly effective treatment. 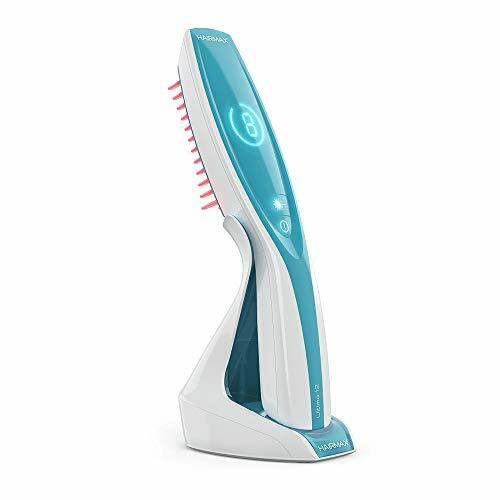 Light and portable at a reasonable 2 pounds as well as being cordless make the laser comb easy and pleasant to use. Its sleek Italian design is pleasurable to look at. It is recommended that you use the Ultima 9 Laser Comb for 8 minutes, three times a week for best results. The product offers a restoration of the hair growth cycle, reverses the thinning process and expects the new hair to consist of increased density, fullness and vibrancy. Results are expected within 12-16 weeks. Prima 9 LaserComb. Clinically Proven Hair Growth Laser Device. FDA Cleared for men & women. Scientifically formulated to address the unique concerns of thinning hair. Thin, weakened and lifeless hair starts to grow in thicker, denser and fuller. At a reduced price compared to the Ultima 9, the Prima 9 Laser Comb comes in at $199. Similarly to the Ultima 9, the Prima 9 has 9 medical grade lasers and the same patented hair parting teeth. In most regards the product the same as the Ultima 9 except it requires 11 minutes three times a week to see results. Comparatively to the other HairMax products it is cheaper and as such, whilst it does offer the same outcomes, it can be expected that it will take longer as well as more consistent use to achieve them. At 2.6 pounds the Prima 9 is heavier than the Ultima 9 and appears bulkier than its fellow HairMax products. However, it still carries a slim and clean design above other competitors. It may be the cheapest of the HairMax Laser Combs but that doesn’t mean it isn’t useful. Follicle boosting ingredients that nourish the scalp to create the optimal environment for the growth of naturally stronger, denser, healthy vibrant hair. Creates the optimal environment for the growth of naturally stronger, denser, healthy vibrant hair. For use on damp or towel dried hair. Spray and massage into scalp. Leave in and style hair as usual. As the name suggests, the Ultima 12 contains 12 medical grade lasers and the HairMax patented hair parting teeth. From 8 minutes, three times a week the same results as the previous two products are expected. Due to the $500 price tag, however, it is to be expected that the Ultima 12 will work at a more advanced level and produce better results faster. Especially due to the additional 3 medical grade lasers. Which is really the defining feature of the HairMax Laser Combs. Considering that, the Ultima 12 weighs 3.6 pounds making it significantly heavier than the other HairMax laser combs. The design still appears sleek and stylish with a beautiful display and it is of course cordless. This may be something to consider when choosing which product to purchase. HairMax offer two different Laser Bands. They appear as futuristic head bands and offer a more complete coverage of your scalp. Both Laser Bands on offer have significantly more laser diodes than the Laser Combs, which ensures they have a higher price tag. However if the Laser Combs do not prove suitable, the Laser Bands may be your salvation. New hair growth, reversal of the hair thinning, increased density, fullness and vibrancy! In clinical studies, over 90% HairMax users experienced new hair growth with an average increase of 129 additional hairs per. Sq. in. An impressive 82 lasers means that with the Laser Band 82, only 90 seconds is required three times a week in order to achieve results. At almost $1000, the 82 earns its price tag by proving more efficient and effective than its fellow products. As well as taking far less time and offering a unique curved design. With 41 lasers covering a larger area of your scalp the Laser Band 41 has increased effectiveness over the Laser Combs. Close to $700, the 41 offers a faster treatment with only 3 minutes three times a week required. Designed for speed, comfort and effectiveness it provides the same outcome as the Laser Bands but at a more convenient rate. Still carrying the hair parting teeth, the 51 user’s laser light intensity and density to provide a highly effective treatment against hair loss and thinning hair. All HairMax products have been FDA approved and clinically tested across many studies. They have been proven to include no side effects and work in a large percentage of situations. As stated previously, they do not work 100% of the time and cannot promise results. However, due to many retailers offering significant money back guarantees, it is possible to trial the products to see whether or not they will benefit you. Continued use at the specified rates is required in order to produce results and only by the allocated timeframes should you be sure to see results.